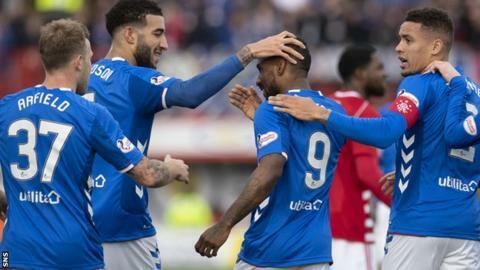 Rangers players "stepped up" without talisman Alfredo Morelos said manager Steven Gerrard as they hammered Hamilton 5-0. Ryan Jack, Jermain Defoe, Scott Arfield, James Tavernier and Kyle Lafferty were all on target. Rangers had failed to win in five attempts without the 27-goal Morelos this season. "It is pleasing because at times we have been over-reliant on Alfredo," said Gerrard. "We have definitely got the quality to create goals and score goals when he's not available. That was the big positive, and the clean sheet as well." The three points restored Rangers' five-point advantage over third-place Aberdeen. "We turned up hungry and with a purpose," said Gerrard. "It's great to see the likes of Jacko [Jack] and Scotty [Arfield] stepping up and really fancying their chances. Again, he [Jack] was consistent; his level of performance is always the same home or away. I know I can trust him. "It was difficult at half-time, it was a difficult team talk to give because we were so comfortable. You always know it's going to be a little bit flatter in the second half."